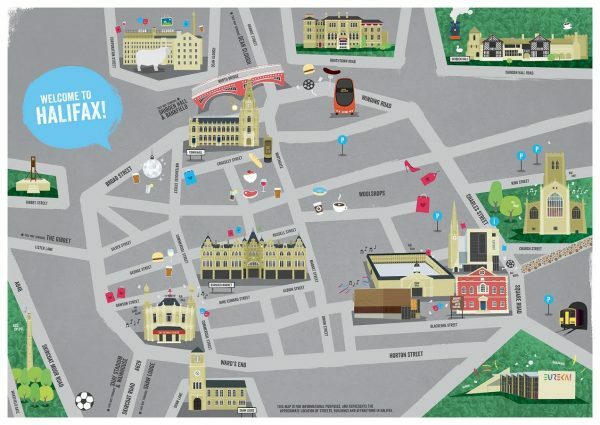 Yorkshire agency The Bigger Boat has developed a new culture and heritage map for the centre of Halifax to showcase the changing face of the town. Featuring a hand-drawn plan, recreated digitally, the project is designed to help both locals and tourists navigate Halifax’s cultural hotspots. With highlights including The Piece Hall, Square Chapel Centre for the Arts and the Victoria Theatre, the key destinations have been carefully selected to cover arts, crafts, leisure and history. It takes style inspiration from the maps of cosmopolitan cities including Madrid, Paris and London and has been funded by Arts Council England through its Cultural Destinations programme. For Calderdale, it's part of a partnership project that aims to develop a strong culture-based tourism offer for the area. The project began in July 2016, and 18 maps have been installed in prime locations throughout Halifax.